HELP SITE. Read it to harness the power of the image index. Get it? ...yeah, it's dangerous to go alone. Alright then, here's how to achieve the awesomeness. First off, wait a little. Maybe a little longer. But that's up to you. You can start off whenever you feel ready. Hover over an image to start its flashloop. Simple as that. Hover away and the flashloop will be all gone. It will not stop until permanent mode is disabled or another image is clicked. The permanent mode was designed to give the possibility to play flashloops in the background, and to make interactive loops possible to use. However, lots of features have found their way into it. stop stops the permanent mode. This is also possible by clicking on the image of the currently played loop again. view@z0r opens a new tab with z0r.de/id in it. See the comments or use the *cough* facebook button. download downloads the .swf file for you. In case of escaping internetz, you won't lack existential resources. HTML/BBCode: Click on the text field to have some code selected. Copypaste it on a board (bbcode) or on your homepage (html) to display the preview image of the currently playing flashloop with a link to z0r.de/id. Instant Link: Same copypasta procedure. Send Links to your friends to show what an awesome person you are. See that launcher in the upper right corner? Enter an id in there and press return. Flash launched in permanent mode, achievement unlocked. Huzzah. Pro Tip: Enter nothing and hit dat return key to launch a random flash. Yayness! Since everyone knows that it IS size that matters, click on one of those nifty links in the upper left corner to change the size of all the preview images. More images to be seen on screen equals more 1337ness. Create a list of your favourite flashloops and send a link to your parents friends to show your awesome taste! Hack this into your url bar: http://z0r.bytezero.de/?list=id,id,id ... with "id" being an.. you know, id. The site will not display all the loops anymore (way too mainstream), but rather only the select choice of yours. Use an url shortener to prevent yourself from posting ridiculously long urls. Nobody likes that. 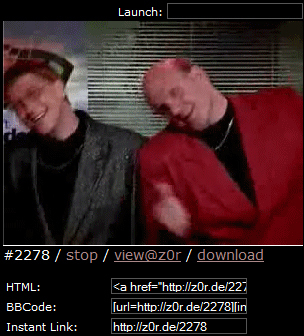 http://z0r.bytezero.de/?order=reverse reverses the order of the displayed images. Useful for seeing the newest flashloops first.